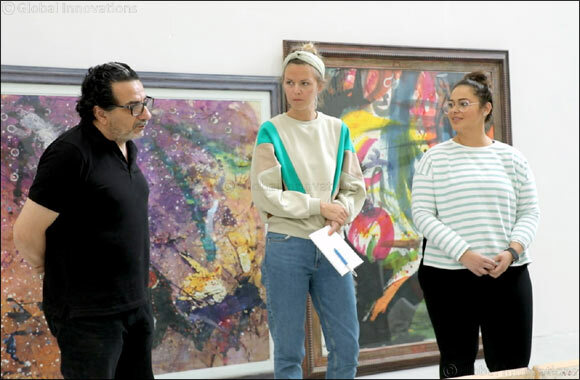 Doha, 26 March 2019 : UCL Qatar Masters students on the Museum and Gallery Programme have partnered with Qatar Art Center to curate an exhibition exploring the process of making art. The exhibition will open on 26 March and will run until 25 April 2019. Since its creation in the 1990s by His Excellency Sheikh Hassan bin Mohammed Al-Thani, the Qatar Art Center is hosting its first ever public exhibition. It has served as a space and a home for prominent Arab artists to live, work, explore, as well as create art together. ‘For the Sake of Art’ is an exhibition that will feature art that has been created within the walls of the Qatar Art Center by four prominent Arab artists: Yousef Ahmad, Nazar Yahya, Dia Al-Azzawi and its founder Sheikh Hassan bin Mohammed Al-Thani. It offers a rare glimpse of the memories, friendships, stories, exploration and processes these artists have shared and experienced over the past two decades. His Excellency Sheikh Hassan bin Mohammed Al-Thani, Founder of Qatar Art Center, stated: “Qatar Art Center is a hub which offers space, providing differing and creative talents with an opportunity to engage, be supported and promote their own production. It can be perceived as an “artists’ residency”. The exhibition will be open to the public from 26 March until 25 April at the Qatar Art Center in Al-Messila. As part of the education and community outreach programme, the team has organised a panel discussion called “Artists in Conversation” which will take place on 26 March. In addition, a series of workshops for families and teenagers will be held on 28 March and on 6, 11 and 20 April (free entry). The workshops will include art-related activities within the exhibition space hosted by exhibition team members of UCL Qatar.